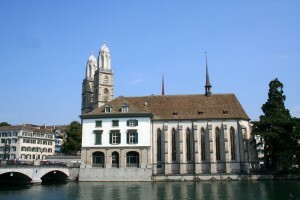 Zurich is often referred to as the "garden city on the lake". A stroll through the fascinating city will soon explain the reason for this. Yet Zurich is also the most important commercial and economic centre in Switzerland, the capital of high finance, one of the richest cantons in the country and home to the famous and very beautiful shopping street, Bahnhofstrasse. Zurich is a bustling metropolis with many new buildings and modern architecture. At the same time however, it also resembles a maze with its narrow twisting lanes, characterising both sides of the city divided by the scenic River Limmat. Age-old landmarks and examples of unique design and artistic styles proliferate throughout the city, although the oldest and best preserved are most densely distributed in Neumarkt. he famous Grossmunster with its two tall towers is the most dominant. Adjacent you will find the late 15th century Wasserkiche and the Rathaus, a graceful town hall built in the renaissance style. Zurich is also a city of entertainments for all tastes and ages, famous for its traditional festivals and holiday celebrations Downtown Niederdorf is the centre of activities. From jazz clubs to restaurants & bars (Zurich is home to more than 1300 restaurants) to more cultural pursuits including galleries, museums and ever-changing exhibitions, there is something interesting on all year round. In order to really familiarise oneself with Zurich, the visitor must experience it from the Lake of Zurich, the third largest in Switzerland. One of the many boat rides by day or night will make you appreciate its size. The perspective of the city and its romantic surrounds from this vantage point is quite unique and not to be missed. Zürcher Sechseläuten Sechseläuten – Zürich’s traditional spring festival – begins on a Sunday with a big parade featuring more than 2,000 children. The actual festival takes place on Monday. Guild members have an early start with a lunch at their own guildhall, and follow it with the big Parade of the Guilds. Thousands of spectators will line the streets along the parade route in the Old City. The highlight is Burning the Böögg, an effigy of winter, on the Sechseläuten field near the Zürich Opera. The Böögg woodpile is lit when the bells of St. Peter sound at 6 o’clock. The Böögg turning to ashes signals winter’s final departure.